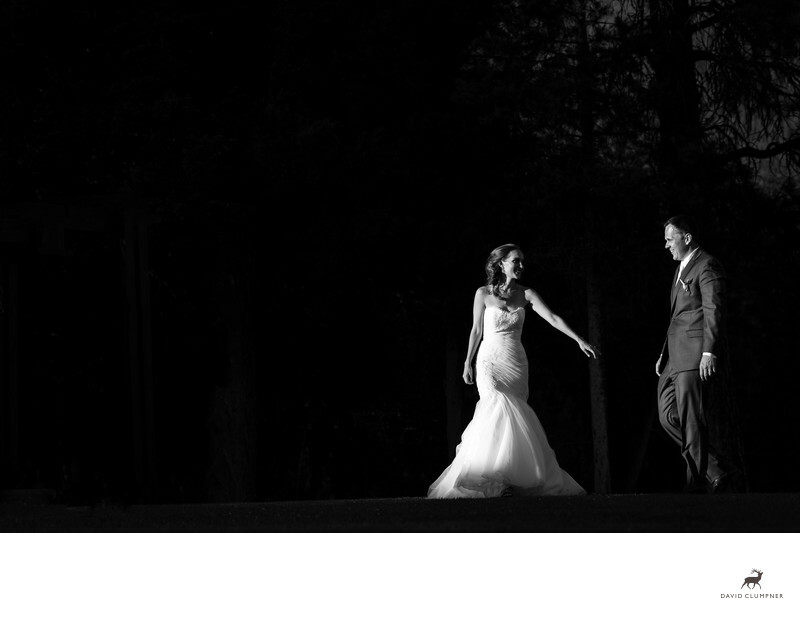 Finding a location where the bride and groom really stand out against a background - without the use of off camera flash - is always challenging. I always ask my couples to give me some flexibility for creative portraits around sunset for exactly this reason. Sometimes Montana sunsets aren't amazing, but often we do get some pretty magical light around that time, both before and after the sun drops beneath the horizon. Here are Holland Lake Lodge, which is situation on a small spit at the north end of the lake, I wasn't sure how the light would fall as this was the first wedding I've photographed there. But along came this shaft during cocktail hour and I grabbed Shelby and Ben without really knowing what I was going to do with them. I pretty much just told them to stay in the light and interact and we ended up with this (and many other) amazing portrait. What I love about this photo is that the couple isn't physically connected. For that reason it would never win an award or be considered a classic wedding photo, but that is probably why I like it. Sometimes it's nice to have a little tension and physical disconnect in a wedding photo. Location: 1947 Holland Lake Rd, Condon, MT 59826. Keywords: holland lake wedding photography (6), holland lake wedding photos (6), Montana Wedding Photographer (87), Montana Wedding Photography (81).